Since its release in 1939, John Ford's Stagecoach has held strong as a gold standard in cowboy cinema. 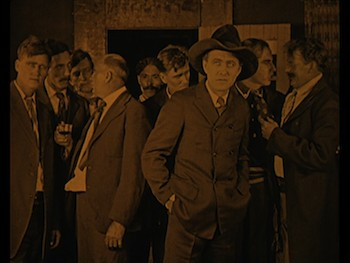 It was Ford's first western picture of the talkie era, and it helped rejuvenate the genre, which had become difficult to undertake due to the advent of sound. It was hard to record out in the open, much less contend with the unruly noise of horses, wagons, and the like. Stagecoach also marked the first collaboration between Ford and John Wayne, a fruitful relationship that transformed the B-actor into a star. As if that wasn't enough historical significance already, Stagecoach also began Ford's onscreen love affair with Utah's Monument Valley. 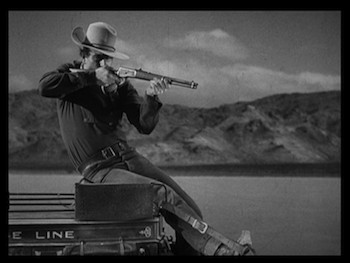 Considering the aforementioned problems with sound recording, it took some doing for Ford to convince the studio to let him go shoot in the open desert far from Hollywood. Yet, convince them he did, and the results are amazing. The wide open spaces, the majestic mountains, the acres of dust--these are things you couldn't get on a studio backlot. In fact, looking at Stagecoach with modern eyes, it's impossible not to notice how good the real locations look and how fake the studio backdrops are by comparison. These are some wondrous landscapes, awesome in scope. How tiny man looks by comparison, how feeble his efforts to recreate the natural world. Ringo is an accidental guest on a stagecoach ride that otherwise started without him. Having recently escaped for prison, he's heading to the same final destination as the stage riders, a place called Lordsburg, a town ironically named after divinity but, as we'll see in the final reel, is anything but. Anticipating that Ringo might show up, the local sheriff has gone along for the ride as protection. Curley (George Bancroft) has known the Kid since he was an actual kid and is looking out for him: Curley doesn't think the headstrong shooter can handle Luke Plummer (Tom Tyler) and his two brothers. So, the lawman sits next to the nervous driver (Andy Devine) and hopes to ferry the other passengers through Geronimo's territory without losing any scalps and to get Ringo in jail before he ends up dead in the street. The rest of the riding group represents a cross-sampling of society. 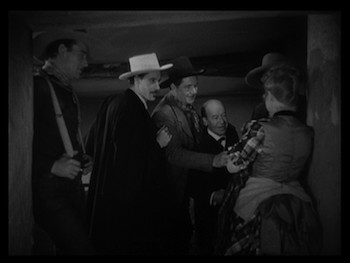 There is the soldier's wife Lucy Mallory (Louise Platt), and the banker named Gatewood (Berton Churchill) on one side; there is the disgraced woman of ill repute Dallas (Claire Trevor, who gets top billing) and the drunk Doc Boone (Thomas Mitchell) on the other. Those two have been run out of town for their sins, whereas the more respectable riders are heading toward something. Both the lady and the financier have their secrets, however, and that will affect how they come out of this story. Further divisions exist among the remaining passengers. Doc Boone is also a veteran of the Civil War who fought for the North, whereas the gambler Hatfield (John Carradine) was a Confederate. He tags along to watch over Mrs. Mallory, with whom he has had a past connection. Lastly, the group also contains the odd man out, Peacock (Donald Meek), a whiskey peddler--much to Doc Boone's delight. Ford assembles his cast and creates a drama both personal and political. Much of what the characters are going through is reflective of the time the movie was made. The moneyman Gatewood is a thieving banker whose disingenuous defense of his own profession didn't likely endear him to audiences that had just lived through the Great Depression (and were still coming out of it). The director's awkward close-ups of the guilty man are jarring, like he is shining an accusatory spotlight on Gatewood--or maybe posing him for a mugshot. As dastardly as he is, even Gatewood is running from something; he fears the same ladies guild whose clucking tongues are responsible for sending Dallas packing. These women are reminiscent of the self-satisfied moralists that caused Prohibition and would eventually get movies censored, as well. The fine society types, including the gambler, turn their noses up at the drunk, the whore, and the outlaw, but Ford does not. His sympathies are clearly with them. For all their bad deeds, at least they are true to themselves and kind to all. Thematically and visually, Stagecoach is all about comparisons of large and small. A large exterior (the open plains) vs. small interior (the stagecoach, any stop on the way), and those who would live in a free and open land vs. those whose minds are small and closed. Ford famously built his interior sets with ceilings, a rarity of the age, in order to make his audience feel the claustrophobia of so-called civilization. Life with the lid off may be dangerous, but the lid's imposed safety is crushing. A mismatched group of people stuck in a tiny vessel on a landscape as far as the eye can see--it's a great formula. 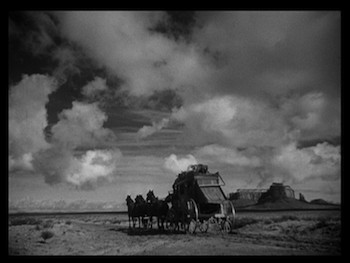 Ford's Stagecoach precedes one of my favorite Hitchcock films, Lifeboat, by five years. In that film, Hitch sticks a handful of survivors from a Nazi U-boat attack on a small rescue boat in the middle of a vast ocean. The close quarters force disparate individuals to face each other and eventually get real with one another, and a rat in the group and a possible outside threat lurking on the horizon creates a thorny tension. Will they avoid the enemy and get home? Or will they end up a tiny blot on the vast expanse of human life? Surely Hitchcock studied Stagecoach to pick up a few tricks from Ford. Uncle Jack withholds violence and builds up the tension until we can barely stand it. Ford's saving up on the action really pays off, too. He goes for broke in one fantastic chase through Monument Valley. All hands are on deck, every able man has a gun, and even within this feverish flight from the Apache, micro dramas play out. In particular, there is a moment between the gambler and the soldier's wife that nearly drifts into the most deadly cynicism, but Mrs. Mallory prays for a Deus Ex Machina, and a Deus Ex Machina does arrive. The whole sequence moves at a breathtaking pace, all the more tantalizing for the fact that it completely sheds the rickety editing, wooden acting, and clumsy cutaways that make some of the earlier, quieter scenes come off as antiquated. It's like Ford was the true frontiersman, and he was just waiting to be unleashed. It seems to me that the reason Stagecoach still feels so alive after all these years is because even though it looks and feels like every Western we've already seen, that it invented every cliché that would follow, right down to its score of American folk music, Stagecoach is really nothing like any of the movies that have followed. Sure, they all borrowed from Ford, but they never really get a handle on everything that works here. Maybe why it worked, but not exactly how. And so for all of John Wayne's ambling around and for the stock character types and even the somewhat predictable stunts (man falls under the horses just at the right spot to have the coach pass over him, Wayne has to jump down and grab the reins at top speed), Stagecoach doesn't actually show the wear of its imitators. The copycat moths could not chew away its wardrobe because it's really cast-iron armor, and it's going to take more than the sincerest form of flattery to tarnish it. It's called good storytelling, kids. Yes, time may change things, standards of quality may shift, technique become more sophisticated, but a good script will beat out 3-D CGI any day. Though, imagining Stagecoach in IMAX with the Duke standing as tall as the highest plateau in Monument Valley...that might just work, too. 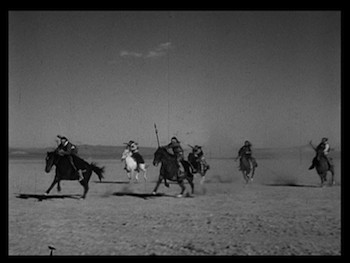 Criterion has a new transfer of Stagecoach and the 1.37:1 anamorphic image is fantastic looking, if far from perfect. Films of this age aren't always going to have materials readily handy to restore the prints, and so at times some scratches or dirt are acceptable. This is one of those times. Except for some surface problems, the overall picture is really good, with nice resolution and only the occasional fuzzy or grainy scene. Compare here one scene at the center of Stagecoach. The first image is from the new Criterion disc, the second is from the Warner Bros. release from 1997. The framing is about the same, but you can see there has been some improvement in clarity. The earlier transfer is much darker. Again, it's not pristine, but Criterion has definitely improved on the older presentation. The monaural mix of the movie also sounds good, though like the picture, not without flaws. 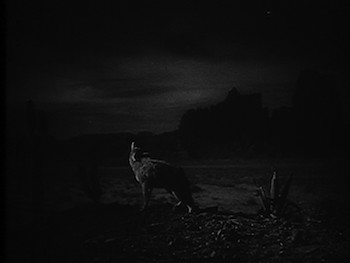 There are some scenes where there is an evident hiss in the background, but it's nothing that obscures dialogue or distorts other aspects of the soundtrack. Again, it's forgivable for the age, and the track has been cleaned up to the best of what is available. All the intended audio comes through and sounds good. There are English subtitles for the deaf and hearing impaired. 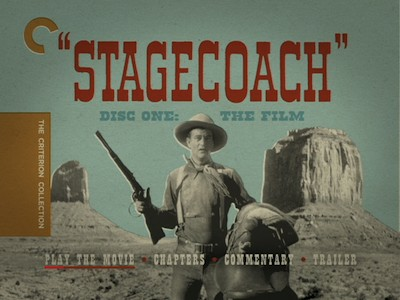 Criterion's two-disc edition of Stagecoach comes in a clear plastic case, normal-sized, with a double-staggered tray to hold both DVDs on one side. 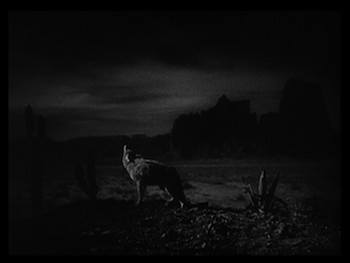 The 32-page accompanying booklet has photos, chapter listings, credits, an essay by David Cairns, and the "Stage to Lordsburg" short story by Ernest Haycox that was the source material for the picture. 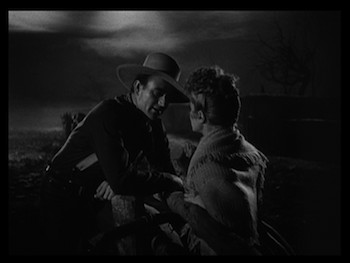 DVD 1 has a scholarly audio commentary by western movie expert Jim Kitses, who gives his impressions of the movie and shares some of its history. The track is informative, though slightly unengaging. The first disc also has the theatrical trailer. DVD 2 is nothing but supplements, leading with the wonderful gift of Ford's 1917 silent film Bucking Broadway. This 54-minute film features cowboy star Harry Carey as a horse trainer engaged to the ranch owner's daughter. Things are idyllic until a city slicker comes in and takes away his girl. Convinced that she is in trouble, the cowboy heads to New York to win her back. It's a melodrama, essentially: a dastardly mustachioed man woos the girl only to reveal himself to not be all he seems. Ford also injects comedy into the story, particularly with scenes of the bumbling country boy in the city, getting hustled by fast women and pulling his gun on a rattling radiator. The whole thing ends in a brawl, and Ford stages the action so that it's big, the men splashing around in a fountain as they plaster each other with punches. 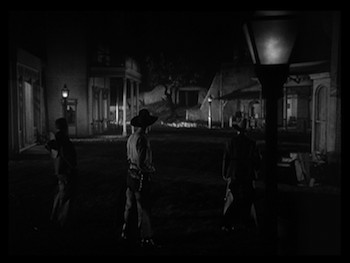 In this early film, the director already shows an appreciation for large landscapes, whether it be outside or inside, the country or the town. One impressive scene shows the men at work breaking horses, and the camera is set up at a distance so that we can see the full length of their ride. Other scenes, particularly the romantic ones between Carey and the girl and the ironically intimate ones between him and the con lady, are shown right up close, Ford using the background to show how intimate they really are. 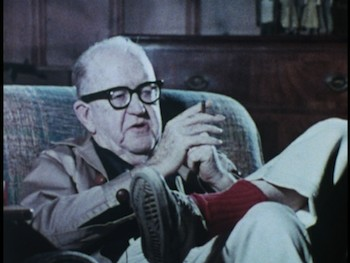 The silent film is followed by a 1968 interview with John Ford (1 hour, 12 minutes, 22 seconds). Conducted by Philip Jenkinson, this extended talk covers many of Ford's films, including both Bucking Broadway and Stagecoach, and his relationship with John Wayne. The cantankerous old filmmaker also confronts his image as a "Western director." He is a challenging interview, steering things where he wants, and turning questions back on Jenkinson when he doesn't like the implications of them. Ford is also profiled, to a degree, by his grandson Dan Ford, who introduces 7 minutes of home movies that show his grandfather off the set and on (including hanging with Citizen Kane-cinematographer Greg Toland). Critical assessments of Stage Coach come in the form of an appreciation by Peter Bogdanovich (14:15), who sits and talks to the camera, and one of Tag Gallagher's video essays, called Dreaming of Jeanie (21:50). Gallagher uses clips to analyze the visual style of Stagecoach. True West (10:45) features author Buzz Bissinger (Friday Night Lights) talking about how Harry Goulding introduced the director to the Monument Valley, and a tribute to Yakima Canutt (10:00), one of Hollywood's orignal stuntman. Finally, an audio program of the 1949 Screen Director's Playhouse adaptation of Stagecoach, which features Ford, Wayne, and Trevor. You can listen to this on the disc itself, or add it to your iTunes by downloading MP3s onto your computer. Some stories stand the test of time, and so do some movies. John Ford's 1939 cowboy classic Stagecoach is among them. The movie that made John Wayne a star and revitalized the western, Stagecoach transforms from a seemingly simple tale about the perils of a passenger carriage crossing the open plains into a drama about the disparate personalities going along for the ride. Full of action, tension, and melodrama, this new Criterion editon gives us the best-looking version of the picture yet, alongside a ton of fantastic extras. Highly Recommended.